← The Greatest Living Lovecraftian Author – Wilum Hopfrog Pugmire – Has Been Hospitalized with Heart Disease in Seattle! The Visual-Bibliography of H. P. Lovecraft’s Collaborator, E. Hoffmann Price, is Nearly Complete! E. Hoffmann Price - His Own Greatest Creation! If you visit the CthulhuWho1 Flickr Collections link below, you’ll have access to the nearly 1900 images currently on display there (with about 40 more being prepared for uploading next), which chronicle the literary life of E. Hoffmann Price. And the companion text of the Bibliography, with far more detail, along with a few surprise items, will soon be posted here at CthulhuWho1.com; and it will be in several file formats to meet everyone’s needs. A decade by decade chronological collection of book and magazine covers, story pages, photographs, letters, documents and more, to chronicle the literary life of the writer E. Hoffmann Price. The 1920’s through the 2000’s decades of this collection are now fully stocked, and the 2010’s are starting to be uploaded. There will also be ongoing additions and corrections to each decade. The magazine images are arranged monthly by their titles; the books are being arranged by their publication dates, and the personal letters are being arranged by letter date or postmark. The rest of the images from the 2010’s will be uploaded as soon as they are finalized. If you have a jpg picture of any of the covers that are missing from this collection, or you have something that is in better condition than what is on display here, or you have any other items that you believe would fit into this collection chronologically, please send a high-quality copy of them to willhart at roadrunner dot com; and you will receive full credit for each item posted from you. This collection is a living document, that everyone can help to expand by contributing images from their own collections. 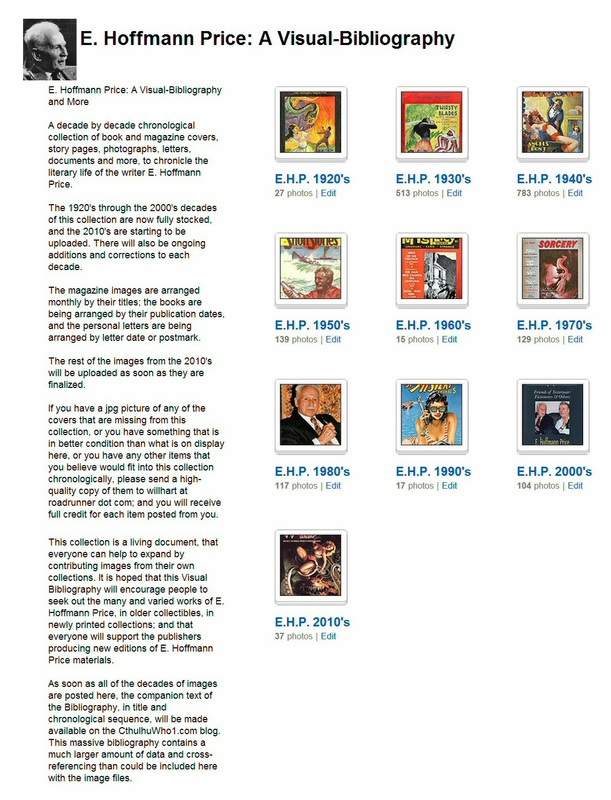 It is hoped that this Visual Bibliography will encourage people to seek out the many and varied works of E. Hoffmann Price, in older collectibles, in newly printed collections; and that everyone will support the publishers producing new editions of E. Hoffmann Price materials. As soon as all of the decades of images are posted here, the companion text of the Bibliography, in title and chronological sequence, will be made available on the CthulhuWho1.com blog. This massive bibliography contains a much larger amount of data and cross-referencing than could be included here with the image files. And last, but far from least, everyone who has posted any images or data related to E. Hoffmann Price, so we could all share the information on the Internet! Most images in this collection, unless otherwise noted, were taken from the Internet and are assumed to be in the public domain. In the event that there is a problem or error with copyrighted material, the break of the copyright is unintentional and noncommercial and the material will be removed immediately upon presented proof. It should also be noted that many of the pulp fiction tales written by E. Hoffmann Price between 1925 and 1955 would not be considered “Politically Correct” at this time; because they were written to the then current standards, and not to today’s. Please don’t be offended by Price using language that “Mark Twain” also used. Between 3-July-1898, the day he was born in Fowler, California, and 18-June-1988, the day he died in Redwood City, California, he squeezed more out of Life than a dozen others might have. A very prolific American writer of popular fiction for the pulp magazine marketplace, who was most widely known as a collaborator with H. P. Lovecraft on “Through the Gates of the Silver Key”; and he was one of the group that included Lovecraft, Robert E. Howard, and Clark Ashton Smith, who all wrote regularly for editor Farnsworth Wright’s Weird Tales Magazine. And yet, he was so much more. During his life, he managed to travel widely and maintain friendships with many other pulp writers and fans. He was also the only pulp writer known to have met face-to-face with all three of the great legendary Weird Tales writers, Robert E. Howard, H. P. Lovecraft, and Clark Ashton Smith during his many trips back and forth across the country. As a teenager, he joined the U.S. Army and served in the Philippines, and along the border with Mexico. During World War I, he served in the American Expeditionary Force in France. After the war, he graduated from the United States Military Academy at West Point before moving on to a later hitch with the Coast Artillery in 1923-24. As his military career was winding down, he had begun writing; and continued to do so while he worked as a supervisor for Union Carbide, from 1924 to 1932, before becoming a full-time writer. 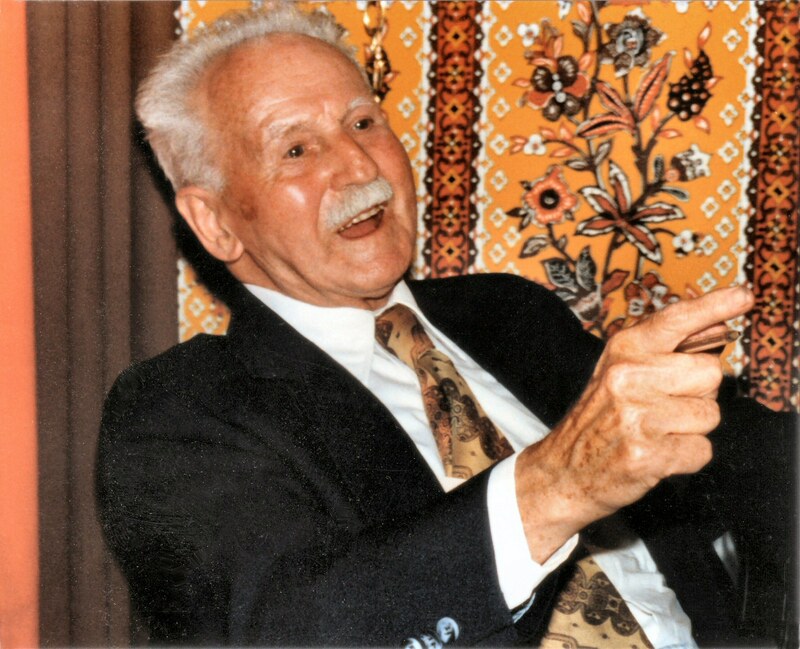 He was a champion fencer, boxer, drinker, horseman, swordsman, an amateur Orientalist, and a student of the Arabic language; he truly was a, “real live soldier of fortune,” as author Jack Williamson called him in his 1984 autobiography Wonder’s Child. In his later years, up until his death in his late 80’s, he worked on his novels, was a steady contributor to fanzines, and wrote about his fellow writers, their works, and the early pulp days. From 1924, when he had his first published story in Droll Stories, to 1955, and the death of the Pulp Magazine era, when he had one of his last pulp stories published in Western Story Roundup, under his own name, and under many personal and house pseudonyms, E. Hoffmann Price produced hundreds of pieces of fiction for a wide range of publications, including: Adventure, Alibi, All Detective, Argosy, Argosy Weekly, Avon Fantasy Reader, Big-Book Western, Black Mask, Candid Detective, Clues Detective Stories, Complete Stories, Detective Fiction Weekly, Dime Detective, Dime Western, Doc Savage, Double Action Gang, Droll Stories, Dynamic Adventures, Fantastic Universe, Fantasy, Fantasy Fan, Fighting Western, 5 Detective Novels, Five Novels, Gold Seal Detective, Golden Fleece, Hollywood Detective, Horror Stories, Jungle Stories, Leading Western, Magic Carpet, Mammoth Adventure, Mystery Adventure, Narraciones Terroríficas, New Argosy, New Detective, New Western, Nickel Detective, Oriental Stories, Phantom Detective, Planet Stories, Popular Detective, Private Detective Stories, Range Riders Western, Real Western Romances, Real Western Stories, Red Star Adventures, Romantic Detective, Romantic Western, Saucy Romantic Adventures, Science Fiction Quarterly, Short Stories, Silver Buck Western, Six-Gun Western, Smashing Detective Stories, South Sea Stories, Sovereign, Speed Adventure Stories, Speed Detective, Speed Mystery, Speed Western Stories, Spicy Adventure Stories, Spicy Detective Stories, Spicy Mystery Stories, Spicy Western Stories, Spy Novels, Spy Stories, Star Detective, Star Western, Strange Detective Stories, Strange Love Stories, Strange Stories, Super-Detective Stories, 10 Action Adventures, Ten Story Gang, Terror Tales, Thrilling Adventures, Thrilling Detective, Thrilling Spy Stories, Thrilling Wonder Stories, Top-Notch, True Gang Life, 12 Adventure Stories, Underworld Detective, Unknown, Unknown Fantasy Fiction, Unknown Worlds, Weird Tales, Western Dime Novels, Western Story, and Western Story Roundup. It should be noted, for those looking for more E. Hoffmann Price stories published under house pseudonyms, that among the many authors given this treatment, Hugh B. Cave was also published under the house names, William Decatur, Paul Hanna, R. T. Maynard, and John Wayne; while author Robert E. Howard had two tales reprinted under the William Decatur (Revenge by Proxy) and R. T. Maynard (Nothing to Lose) names too. E. Hoffmann Price knew how to write, and he knew how to sell. And yet, he is still today primarily known as a Lovecraft collaborator and Weird Tales writer who also wrote adventure stories with Oriental settings and atmosphere; even though most of his life’s work had nothing to do with Lovecraft or Weird Tales. I suspect that part of the problem is that most genre collectors have little interest in other genres than their favorites, Detective, Mystery, Weird Tales, or Western Tales; each ignores the other, and fails to look at the sum total of Price’s incredible output. And writing under many different pseudonyms, and using rewritten versions, or renamed versions of many stories also adds to the confusion. He was awarded the World Fantasy Award in 1984 for Lifetime Achievement. This entry was posted in Covers, CthulhuWho1, Documents, E. Hoffmann Price, Flickr Lovecraft Updates, Flickr Updates, H. P. Lovecraft, H. P. Lovecraft Updates, Letters, Lovecraftian, Photographs, Postcards, Pulps, Scans, Screen Captures, Short Stories, Unabridged, William (Will) Hart and tagged "E. Hoffmann Price", Covers, Documents, H. P. Lovecraft, Letters, Novels Serialized, Pulps, Scans, Screen Captures, Stories, Will Hart, William Hart. Bookmark the permalink. 1 Response to The Visual-Bibliography of H. P. Lovecraft’s Collaborator, E. Hoffmann Price, is Nearly Complete! Thank you, Will. This is fantastic. I love the photo you placed at the top of the post to get us started.